﻿ Reviews 2017 for Provence Cycling Holidays - self guided bike tours in the Luberon, Provence, France. REVIEWS FOR OUR B&B-BASED TOURS. Fantastic Cycling Tour in Provence!!! We were warmly welcomed by Neil, Natalene and their two children Lucy and Jamie into their home and historical B & B! Each day Neil outlined the bike trip we had selected for the day as we enjoyed our breakfast alfresco. He offered routes for every cycling level. Every day we saw a different part of the Provence countryside. We biked through orchards, lovely vineyards and wineries and into charming hillside villages. The villages had a slightly different flavor each day! We also enjoyed dining at the B& B on the nights Neil provided a wonderful 3-course dinner for us! As well as each day as we were biking Neil and Nat suggested their favorite lunch spots which did not disappoint!! We loved that we returned to the same spot each day to relax and then enjoy dinner at the B & B or pick a recommended restaurant for dinner nearby! If you are looking for a cycling vacation in Provence this is the one for you! Jayne & Gregg - US - Oct 17. We were looking for the perfect vacation, a combination of cycling, sightseeing, good food and nice people. Neil & Nat's place is totally the one. With Neil's guidance we got to see the most beautiful places, villages and roads. Neil set with us every evening and did everything he could to fit the routs to our requests. The hospitality was supper nice; on the one hand they made us feel at home and on the other hand we had our privacy in our quiet, large and beautiful room on the second floor. Neil's dinners were one of the best things in this trip, cooked and served with love. Miss them already. 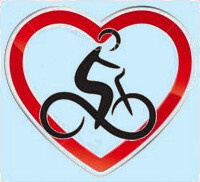 The bicycles were in an excellent mechanical condition and made the rides enjoyable and easy-going. Many thanks to Neil and Nat for great memories de Provence. Ruth & Guy - Israel - Oct 17. After biking for 88 days across the US on the Northern Tier route, I needed an easy, creature comfort ladened ‘vacation’ trip. This was it. The location in Provence was perfect, the weather ended up being perfect, our biking group of eight friends was perfect, the bikes were perfect, our accommodations were perfect and the family run Provence Cycling Holidays with Neil and his family was perfect!!!! Working out of a home base everyday on our self-guided and self-paced tours was the way to go. We could bike as little or as much as we wanted, leaving enough time for sightseeing, shopping and of course eating!!! The time Neil put into researching and developing the courses one has to choose from for each days ride, made everyone of them a winner. Anyone looking for a nice French biking experience . . . I would highly recommend the way we did it. R S - US - Oct 17. One of the best vacations we've had! I'm not a cyclist, but my husband is, so when I booked this trip I knew I'd have to make a commitment outside my comfort zone. However, we BOTH had a great week. It was the perfect combination of cycling and sightseeing. Neil has carefully planned out all possible routes -- some challenging, some more relaxing -- and there are many, many choices. Every morning at breakfast, he reviews with you what you've chosen; his local knowledge is incredible and he offers recommendations ranging from quick stops to lunch spots to photo ops on each route. Neil provides a couple of different types of bikes (including e-bike, not a bad choice if you plan to do a lot of hills) and helmets. Dinners are at the B&B three times during the week, but there are lovely area restaurants as well and Neil takes care of the reservations if need be. Our room was quiet, large, and had a huge private bath! All rooms are on the second floor. This is a lovely part of France and we got to see places we would never have known about otherwise. We've just scratched the surface and I think we'll be back. In addition to all the other plusses, Neil and Nat provide their own brand of warm hospitality, ensuring each guest has a memorable week. Gail - US - Sept 17.
what can I say about this place other than its a must place to stay if you want to sample a slice of the fantastic area of France on a bike. Neil and Natalene have created the perfect place to explore the lovely hilltop villages that are dotted around this part of France, from the easy to follow guides using garmin devices to a list of restaurants and must see places to make any visit here nothing is left to chance. The farmhouse is beautiful it also has a pool but most of all the lovely family who make you feel at home are what make this place stand out from the crowd. I also must say that I have a new found appreciation for Luberon and Ventoux wines from this area which are not common back home. Bonney & John - UK - July 17. Thinking about a Cycling Holiday - this is for you !! Where does one start - when I read the reviews my first impression was "this is for me" and I was absolutely one hundred per cent correct. If you are thinking about doing a cycling tour that's not too strenuous, you enjoy exploring villages, shopping, drinking coffee or a cold beer etc this is for you. My husband, Barry, and I enjoyed a week with Neil, Nat and their family in June. We had the best time ever, the cycling was great, Neil would accommodate every need from shortening the routes due to the incredibly hot weather to coming and rescuing you if you get lost. (hard to believe but yes we got lost!!). The beautiful home cooked meals, to the relaxed pool surroundings and refreshments was more than one expected. I have to say the breakfasts were outstanding and we always look forward to the gorgeous French pastries each morning along with the freshly brewed coffee. There is so much to see and do in around Coustellet, the hill top villages, lavender museum and fields along with shopping just to name a few. Everything is within close distance. Each afternoon after arriving back from our ride we would cool off in the pool and then go and explore another village by car. The nights we didn't dine in Neil helped us as to the type of food we felt like, where to go and with bookings. He never let us down !! The hospitality we received was far more than what we ever expected. A massive thank you to Neil and Nat for making our holiday so memorable. Yes we will be back - planning has started!! Helen & Barry - NZ - July 17. This vacation will be hard to beat! From the wonderful bike routes and scenery to the fabulous food and company, the 5 days of cycling and 6 nights we spent at Neil and Natalene's lovely B & B will be tough to surpass. We booked the entire B & B and our group had a range of cycling experiences but Neil was able to meet all of our needs and wishes with grace. On the days the group did not cycle together, Neil put together more difficult rides for the crazies and more leisurely rides past lavender fields for those more sane riders. On those days, Neil planned our routes so we were able to meet for lunch in one of the picturesque villages. He even kept an eye on the weather and modified our routes based on the forecast. It is amazing the amount of work they've done to put together such a wide array of rides, along with favorite restaurants for lunch and short walks and sites to see around the villages you bike to. The routes were all entered into a Garmin - which was very easy to use. After a hot day out on the bikes, we all looked forward to a dip in the swimming pool. We ate dinner out in one of the villages every other evening which gave us more opportunities to see the area. And the dinners we had at the B & B were so good we had to ask for the recipes. The beds were comfortable and the bathrooms were all updated. And although the house does not have air conditioning, Neil assured us that the thick stone walls would keep the house cool and he was right! We had such a great time none of us wanted to leave. Great memories and a wonderful time was had by all! Lou Ann, Ramsey & friends - US - July 17. Best self guided trip that we have done..ever! Location, organization, equipment, food, were top notch. Neil has created a number of rides that permit a fabulous sampling of what Provence has to offer - villages, sites to visit, restaurants. To stay in one place and have so many choices of rides was amazing. We had a superb stay and enjoyed the breakfasts with fresh bread and croissants from the local bakery. The home cooked meals were delicious and a great opportunity to party with the other guests. The pool and WiFi were appreciated! We have done trips in 5 countries and this tops them all. We have told our friends about this wonderful self guided trip and we will be back! Janet & Michael - Canada - July 17. It's hard to believe that only a month ago we were sitting on Neil and Nat's patio in sunny Provence... Surrounded by an amazing Luberon scenery, sipping rose wine and reflecting on the day's ride in great company - we got to live this dream for 6 straight days! Previous reviewers have done an excellent job sharing details of their experiences here, so I will just reiterate: the package that Neil and Nat put together is hard to beat. All the pieces of the puzzle (from B&B base, GPS navigation, "locals-only" insight and support, world class location, quiet roads and understanding drivers) come perfectly together to make this an ideal cycling holiday. We'd be back in in instant and hope to have another chance in the future! Jane & Derek - Canada - July 17. Neil provides dozens of itineraries around the region that loop back to base. You can pick and choose depending on the weather, your appetite for hills (or not) and very importantly, your preferences for lunch. All the routes are carefully planned to take you through scenic orchards, vineyards, wheat fields and forests using back roads that you wouldn't even notice from a car. Neil, Nat and their family are wonderful hosts and full of local tips and help. The bikes are brand new and food is delicious. A fabulous holiday for teens, parents and grandparents alike. Jenny & Tom & family - Ireland - June 17. The Luberon provides wonderful cycle touring: vineyards, orchards, fields of lavender and hilltop towns with cafes, restaurants and 12th century churches. However, the main roads can be heavily trafficked and the navigation complicated. Solution: staying here there are bikes (including electric bikes) provided and fitted with GPS. Neil has available a large repertoire of rides going through charming back roads and tracks. After a great day, plunge into the fine swimming pool. Sally & Peter - Australia - June 17. While researching for a bike trip in Provence, I luckily found Neil and Nat's website. The opportunity to stay in a 17th century farmhouse for six nights AND take daily bike rides throughout the region sounded so appealing. A vote went out to the family(husband, 27 yo son and 23 yo daughter) and it was unanimous. The accommodations were excellent...we shared a bathroom with our kids and had the Gordes and Menerbes rooms. The farmhouse is off the beaten path in the village of Coustellet. 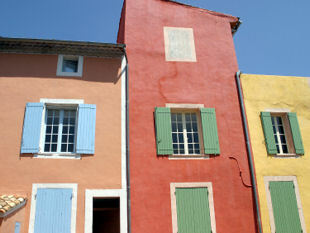 It is within easy walking distance to restaurants and the Lavender Museum. The grounds are lovely and the pool is fabulous after a day of riding. Renting a car in Avignon was the way to go...it's an easy drive and then one has the flexibility for taking Neil up on some amazing restaurants in the area for your three nights on your own. As for the food at the house....EXCELLENT!! It's a family gathering for breakfast daily and three dinners. Lots of fun, laughs, sharing stories of the day, sharing your lives with new friends, asking about the Provencal way of life, etc. The meals are top notch and taste so good after a busy day. I have even swapped a recipe with Neil. Local wines/beverages are offered as well. Having your laundry done as needed was an unexpected bonus. The WiFi was excellent. As far as the rides, I am not an avid rider and was a little worried. No fears....Neil has it all worked out and can accommodate whatever level rider you are. Bikes are great and the scenery is stupendous. I kept saying "This is exactly what I wanted this trip to be." Although the lavender was not in bloom, the poppies and wild flowers were lovely. You ride for the most part off of the beaten path through the countryside and little villages. Nat and Neil were so helpful and their kids were terrific. This was a great trip and a great opportunity. We would definitely return... I already have visions of renting the villa with a bunch of friends. That really sounded like fun. Carrie, Rob, Hugh & Coco - US - June 17. On the last day of our delightful week cycling with Provence Cycling Holidays, I cried with joy and gratitude all the way from Gordes to the end of our route. This single-based, self-guided cycling week was a dream come true for me and my husband, and every moment of biking through those gorgeous Luberon hills and valleys exceeded those dreams. I also had to hold back the tears when we said our goodbyes to Neil and Nat, and their children Jamie and Lucy, when we left for the next leg of our journey. They not only provided exceptional services during our week-long cycling holiday, but they welcomed us into their home and their family life. It was a personally enriching experience to share our experiences with them and the other cyclists who were there that week. Let me tell you just a little bit about their exceptional hospitality. The room and brand new, modern bathroom in this old Provencal farmhouse were just right. Neil provided a thorough orientation each morning to the route we had chosen for the day, including restaurant recommendations and things to see and do along the way. The Garmin GPS devices were programmed for staying on the established routes. Breakfast included a wide array of choices, including delicious, locally-made breads and pastries. Neil's dinners (on half of the evenings) were superb, top notch. They even washed our soiled biking clothes. But the best part was sitting around their table with the other cyclists and their family, outside in the fresh Provencal air, and sharing stories from the road and from our lives. We felt a personal connection to them and to the others from our group. And let me say, biking in the Luberon was spectacular. Neil was able to find rides for us that perfectly matched our interests and cycling ability. We got to ride mostly on lightly-travelled one lane roads through fields of Lavender (almost in season), cherry orchards, and vast fields of wild flowers, past old farmhouses and through quaint villages. We cycled through the hilltop towns of Menerbes, Oppede, Bonnieux, Lacoste, Rousillon, Gordes, and others. The scenery was spectacular. The cycling was just right, with rolling hills and some moderately challenging hills. Thank you, Neil, Nat, Lucy and Jamie. You helped to make our Provence cycling dream come true. We will be back. Greg & Steve - US - June 17. Exceeded our expectations in every way! We're just home from a truly memorable way to experience Provence and our best (four so far) self-guided cycling tour. As we'd hoped, the daily rides were really well planned - peaceful country roads, a couple steep hills, and beautiful villages with interesting history/sites/markets and charming restaurants. The Garmins worked great - the weather was perfect. What pushed this trip over the top, though, was Neil and Nat's warm hospitality and personal attention. Neil's daily route briefings, delicious home-cooked dinners, restaurant tips/bookings, binder loaded with info about Provence, and yes even laundry runs were all fantastic! We loved the ease of returning to the same venue every night and getting to know Nat, Neil, their terrific kids, and the other guests. Neil also provided excellent suggestions for several days on our own in Saint-Remy. We honestly couldn't have asked for a better six days. As a small, family-run business, Neil and Nat invite you into their home and lives - you don't get this experience with a large cycling company. We'd love to return and try out their new villa in Taillades. Sue & Terry - US - June 17. Whether you are a serious cyclist, a weekend biker or an occasional peddler, you will find that Neil and Natalene have a variety of cycle routes mapped for you to enjoy. 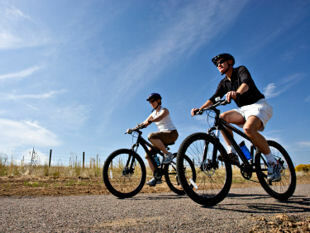 The area, with it's historic hill top towns and beautiful countryside are ideally suited for touring whilst on a bike. You will be welcomed into Neil and Natalene's home and will soon feel as those you have known them for years. The food is excellent, as is their choice of wines. What is so attractive about this holiday is the variety of rides on offer and if you want a day out of the saddle there is plenty to see if you choose to drive a little further. And for those of us who like a challenge, Mont Ventoux sits invitingly a little to the north, where cycles can be hired and serious calories burned on the way to the summit. Anne & Tim - UK - June 17. We spent a wonderful six days here last May. The hospitality was first class and we loved planning our route every day and exploring the beautiful local area. In the evening it was fun to catch up with the other guests in a warm and convivial atmosphere. We also enjoyed the meals we had at local restaurants all within walking distance allowing for a glass of wine or two! I have no hesitation in recommending Neil and Nat if you are considering a cycling trip in this area - you won't regret it! Anne & John - UK - April 17. Beautiful views, warm welcome and fabulous food! We went for a week on a cycling holiday to Neil and Nat's B&B near Coustellet last year and we are still dreaming about the place. We have been meaning to write this review for a long time. It was one of the top holidays we have ever been on and we still remember it well. Neither of us are cyclists, but we love the outdoors and love to be active. We heard how beautiful the Provence countryside is and we wanted to see it. We also love a relaxing holiday so the thoughts of packing up and moving place every night was not for us. This holiday was the perfect answer. It was great to sit with people at dinner from all over the world. The cycling was so beautiful. The routes were so carefully planned off main roads where there would not be any traffic and it was so peaceful. The villages that we visited were breathtaking. 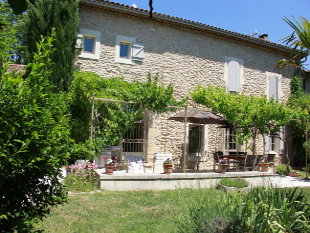 I found the whole week so easy, we were extremely well looked after, the rooms were very comfortable and the house was authentic French country house. Shauna & Ray - Irland - April 17. Our stay with Neil, Natalene, Lucy, and Jamie turned out to be the highlight of our European holiday. Neil’s personalized route planning makes for a very enjoyable cycling experience. Each morning Neil discusses the cycling options and tailors the routing to your specific interest. There’s lots to choose from: hill top villages, ancient castles, vineyards, canals, outdoor markets, and of course, lavender fields. Neil and Natalene are very tech savvy and have programmed all the routes into GPS units which	mount on your handle bars, it’s almost impossible to get lost. If you make a wrong turn, the GPS beeps and politely tells you how to get back on track, no need to fumble with maps or argue over directions. We dubbed it cycling for dummies. The evening dinners were also wonderful with great food, wine, lively conversations, and even an impromptu dance performance by Lucy. We felt totally pampered! Lynn & Blair - Canada - February. 17. For other years' reviews, please click in the Menu.